Coal-based carbon foams are a new structural material made in a cost-effective proprietary process. The result is an inexpensive, lightweight, ﬁre-resistant, impact-absorbing material that can be thermally insulating or conducting, and whose electrical resistivity can be varied over many orders of magnitude. Coal-based carbon foams offer systems designers alternatives to current design materials, extending the performance ranges in material systems where they replace more conventional materials whose peak performance levels have already been reached. 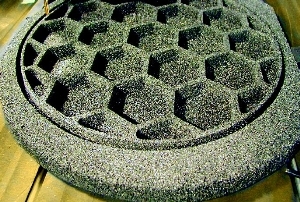 With its ease of use, coal-based carbon foams can be cut, milled and turned with conventional equipment and tooling. Integration with other materials including impregnation with phenolic or other resins, and lamination with Kevlar or other laminates, is straight-forward, creating a broad spectrum of potential applications to defense, aerospace and commercial markets. These topics are explained briefly in Carbon Foam Military Application PPT Report with illustrated images.If you want to download the Carbon Foam Military Application PPT then simply click the link given below. There is also given the preview and link Carbon Foam Military Application PPT Report uploaded in YouTube. All the images used are copyright to the owners of the respective websites mentioned in the Carbon Foam Military Application PPT Report reference slide.